Combine all ingredients in a drink mixer tin with 12 ounces of crushed ice and 4 to 6 “agitator” cubes. Flash blend and then open pour with a gated finish into a Collins or highball glass. Garnish with a mint sprig. I am old enough to remember when every city and small town had at least one “Polynesian” restaurant. I put that in quotes because it had as much to do with Polynesian cuisine as Outback Steakhouse has with restaurants in Australia (never ask an Aussie if they would like a Chocolate Thunder from Down Under). These were kitschy joints with lots of bamboo and grass and faux Tiki carvings on the walls. As I kid I’d always laugh at the “Pu Pu Platter” (and I realize this post is getting pretty scatological) but I would gaze at that page of exotic cocktails I was too young to drink, with names like the Zombie and the Scorpion. Many of them would have stern warnings like Strong – limit 2. When I got older I would have some fond memories of drinking these drinks (when I could find them). They were sweet and spicy and usually worthy of any warnings on limits. When I started my cocktail journey with Ted Haigh’s book I looked forward to making the tiki-style drinks he shared. This Christmas I got a number of cocktail books, and my current favorite is Smuggler’s Cove: Exotic Cocktails, Rum, and the Cult of Tiki. To be quite honest I’ve now made several drinks from it, but this is the first one I managed to document. 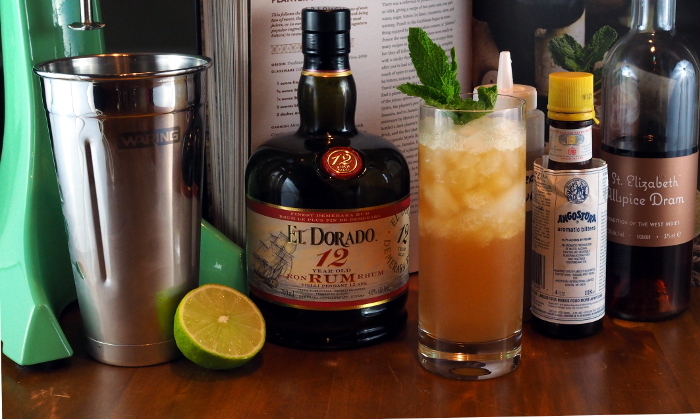 All of them have been good to amazing, and the Planter’s Punch is no exception. There are several things I like about the book. The first is the way they present their recipes. One issue I had with Vintage Cocktails is that quite often it would call for an ingredient like “gin”. I own a shelf of gin, with tastes that range from fruity to ones that I imagine eating a pine tree would taste like. I have Navy-strength versions that will put hair on your chest, but often with old recipes we are given little guidance as to which to use. Then there is the opposite, with books like Death & Co. and the Dead Rabbit that call for ingredients so obscure that I can’t even find them at well stocked places like Binny’s. Smuggler’s Cove takes a different approach: they list eight different categories of rum with examples of each, and then in the recipe they just reference the number. This drink calls for a “blended aged rum” which happens to be category three (3). That approach, which brings these cocktails into the reach of people like me, works throughout the book. Take their recipe for grenadine. Some books might lead with “hand pick the finest, fresh pomegranates you can find, harvested at the peak of ripeness. Open the fruit and remove the arils to a non-reactive pot …” or something like that. These folks say “go buy some POM pomegranate juice“. I did need to buy another piece of equipment for the bar: a drink mixer. They offer three choices in the book from light to heavy duty. The light duty option, the Hamilton Beach 760C, made me smile. When I was working my way through college I spent my weekends working in a plastic injection molding plant. I made the base of that blender. While it looks metal, it is actually chrome coated plastic, but due to that coating I had to wear cotton gloves the whole day. Hated making those things, and I know were to look for a slight imperfection due to a small scratch on the mold put there by my foreman. I doubt they are still using that mold today, but it still brought back memories. The medium duty mixer, the Waring PDM, is what I bought, as I really like the retro design and plan to use it enough to justify the price difference. I didn’t even consider the high end model, the Hamilton Beach Single-Spindle HMD200, because I’d want to use it enough to justify the cost and I do have a day job. Once I got my mixer I had to learn some new techniques. The term “flash blend” means to pulse the mixer for 4 or five seconds a couple of times. This mixes and aerates the drink. “Open pour” is sometimes called a “dirty dump” – most vintage cocktails call for the ice used in mixing to be strained out and replaced with fresh ice in the glass. Because of the syrupy nature of many tiki-style drinks, that would leave a lot of the liquid in the mixer and not in the glass. Finally, a “gated finish” answered a question that bothered me at first. I have glasses of various sizes. How do I know exactly how much ice to mix in so that the glass is just filled? The answer is to pour in most of it, but then use a strainer to “gate” the rest of the ice so that all of the liquid makes it to the glass. Then you can top up as needed with more ice. The Smuggler’s Cove version changes it to “one of sour, two of sweet, three of strong and four of weak” and I did like their recipe a little better (and not just because it scans). But Haigh did show me how much the choice of rum matters in a drink. The only difference between Jasper’s Planter’s Punch and Jasper’s Rum Punch was the rum (and I loved the Rum Punch). This drink represents everything a Tiki drink should have: the sweet and sour of citrus and sugar, the spicy tang of the Allspice Dram, and the wallop of three ounces of rum. Notes: This drink called for a Jamaican aged rum, and I didn’t have any. Since it also called for Demerara syrup I figured a Demerara rum would work well, so I went with El Dorado 12 year and wasn’t disappointed.